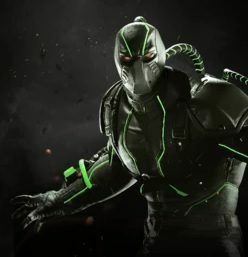 This page contains a character guide for Bane in Injustice 2. Here you’ll find movelists, combos, juggles and strategy guides and recommended gear for the villain character. For more Injustice 2 content, head over to our Injustice 2 top page. Growing up in Santa Prisca Peña Duro prison, he is an intellectually gifted person and was educated in the ways of crime. He was subjected to experiments with the drug Venom, which gave him super strength. He possesses a keen intellect and a body trained to physical perfection in the harsh environment of the Peña Duro prison. After being exposed to the experimental drug Venom, Bane’s physical strength was increased to superhuman levels, fluctuating depending on how much has pumped into his system. In battle, Bane uses his great strength and body size to his absolute advantage, employing his surprising speed to overwhelm his foe with powerful strikes. His strength and size contribute to his formidable durability, as Bane can take almost as much as he dishes out. Meter Burn R2 (must press R2 at the end of Raging Charge). 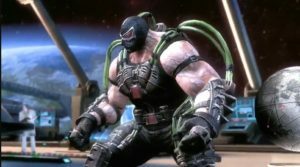 Bane can dose himself with one, two, or three levels of Venom (even while attacking), increasing his overall damage per dose and adding armor to his specials. When the buff wears off, Bane will become weakened. While weakened, Bane will inflict less damage, take more damage, and will move at a slower speed. This weakness is intensified based on the amount of Venom used. Below are combo and juggle inputs for Bane , including corner strategies and restarts. He wears brown cargo pants and a sleeveless black muscle shirt that is tucked in his pants. His belt has a fairly large buckle. He wears black gloves and black boots. He also wears a black and white Lucha Libre mask, which can appear as a skull with red eyes if looked at closely enough. He has venom tubes running from his back to his arms, chest, and inner thighs. He also has pieces of metal protecting his forearms, feet, and knees, with notable spikes. He wears a ripped orange prison uniform with his venom injection system on his bare chest. He also has metal protection on his arms and legs. Fred Tatasciore also voiced Bane in Batman: Arkham Asylum and Batman Arkham City. He is best known as the first villain to have ever “Broken the Bat”. He crippled Batman in the early 90’s of DC Comics, forcing Bruce Wayne into a year-long retirement. He is currently the only Latino character in Injustice. He was born in the prison of Peña Dura, Santa Prisca.